Inter Technologies develops cutting-edge installed and portable solutions for legal professionals. 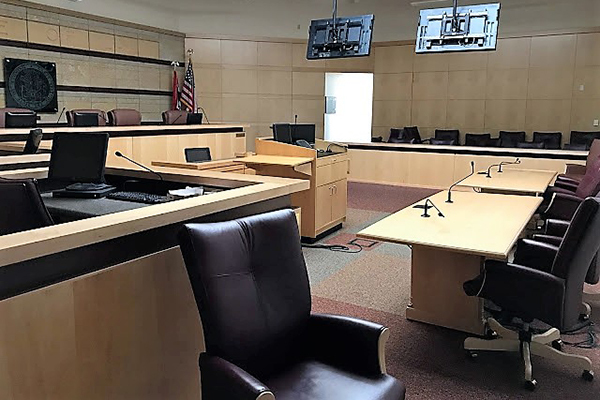 Our engineers work closely with law schools and courthouse personnel to design and install moot court training rooms and courtroom technology systems. We design trial technology solutions that are simple to operate and provide the judge with full control of the presentation system from the bench. We make sure that attorneys and expert witnesses can readily access the system and clearly present their case. Our sound engineers thoroughly test each system from every area of the courtroom to ensure that court reporters, jurors, and the courtroom audience can easily see and hear all information presented at every stage of the proceedings.